It is with great pleasure that we announce the (re-)appearance of articles from slctacos.com. We appreciate your patience dear readers as it’s been too long since we’ve last provided you content in the form of hard hitting taco journalism. But let’s not dwell on that. Let’s get to the TACO SHOWDOWN. It’s been years since we’ve featured a TACO SHOWDOWN wherein a number of taco enthusiasts perform some “taco science” as they conduct a taste test of various taco stands during lunch to determine which one has their favorite tacos. 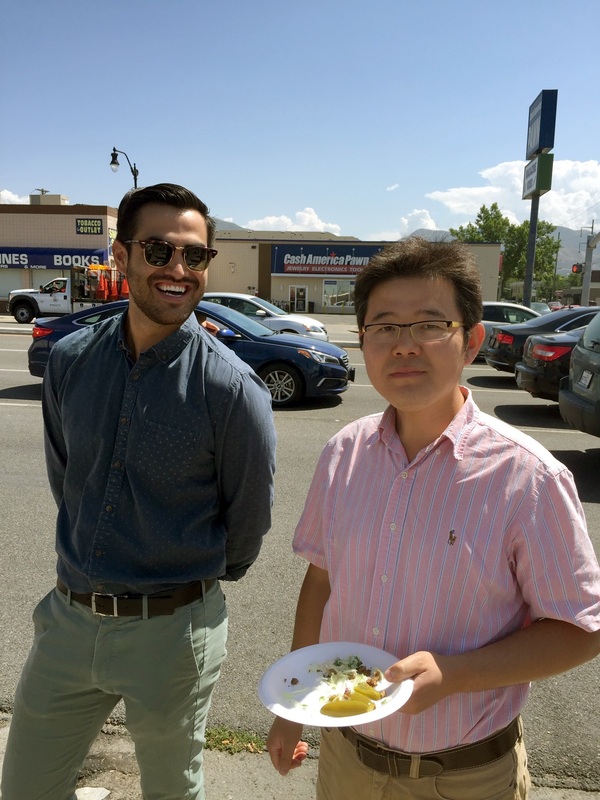 In this edition, I had the pleasure of tearing up some tacos with my gracious work colleagues. All of these taco warriors were ready not only to put away some tacos but gather some data in the process. 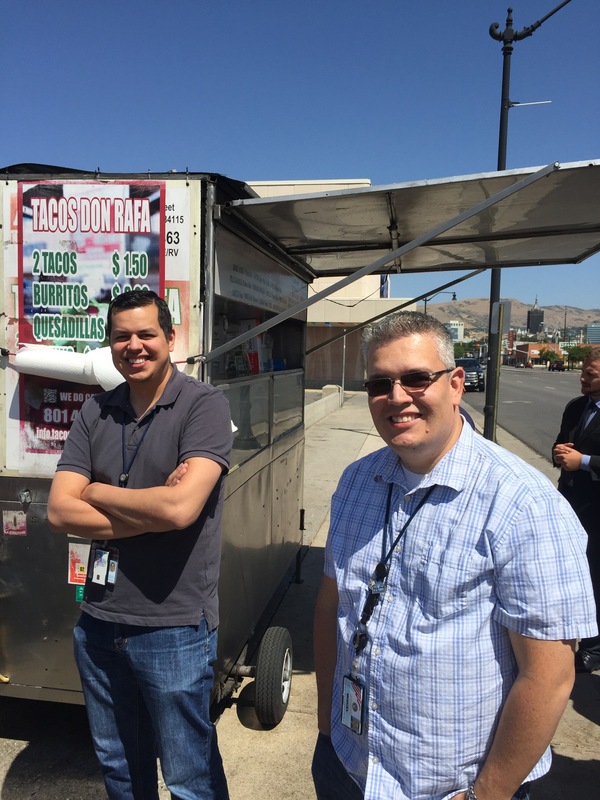 For some, this was a first street taco experience. For that we are grateful to have been there with your for this occasion. We take it from these interviews that this will not be their last taco experience. Taco Enthusiast Yiwen finishes her first ever street tacos. I’m expecting that she will soon be a guest author here. TACOS DON RAFA or TACOS EL TORO? For those of you playing at home, a gentle reminder is these taco stands exist on the same corner of 800 South and State Street and that Don Rafa is on the “State Street side” while El Toro is located on the “800 South side”. Keep this in mind as you perform your own taco orientation upon arrival. While this was not the most careful study every conducted, we did collect some data from a number of the participants as far as their preferred tacos. Not all taco enthusiasts had the same style taco at both stands, bot for those that did, we collected some data to share with the taco community. Of the 13 participants interviewed, 12 consumed at least one taco style from both Don Rafa and El Toro within the taco session. The other participant had a single quesadilla from one of the stands and was then too full to perform a comparison. A simple plot of the preferences can be seen below in Figure 1. From these results, we see strong preference for Tacos Don Rafa when it comes to Carne Asada tacos with a vote of 7 to 3. We’d certainly like to conduct more research on this matter before we crown Tacos Don Rafa as the better of Carne Asada tacos so please cast your votes in comments below or by sending a postcard with your vote via U.S. Mail to SLC Tacos HQ. We read all of our mail. Taco veteran Patrick observes as taco enthusiast Fangxiang enjoys his first plate of street tacos in his life. Fangxiang said that he enjoyed street tacos because they reminded him of childhood memories of eating street food. There’s no conclusion to be drawn from the close voting on Al Pastor tacos (4 vs 3 for Don Rafa). Finally, there’s only a sample size of 1 taco enthusiast voting in the Chicken race but we placed it here just to make the graph look more interesting. It is interesting to note that stratifying the results by those new to street tacos (n=3) compared to seasoned taco veterans (n=10) there was no significant pattern of whether taco initiates or verterans compared one taco stand versus another. This inquiry should be continued in later work. ZW samples his first ever street tacos. This was such an honor. There is no doubt that this was my favorite moment of the day. It was my privilege to have been present. Tacos are delicious. We should all eat more of them. Tacos veterans Nefi and Miguel enjoying some Tacos Don Rafa!!! It was an absolute delight sharing tacos with my good friends. It was an honor that this was a first occasion for many in the group. I hope that the trend continues and we do another TACO SHOWDOWN soon. In the meantime, is there a new taco stand that we should review at slctacos.com? Do you have any hot leads on something we should cover? Please leave a comment and join in the taco discussion. Let’s hear it for Taco Science! MRIN (more research is needed) especially with the chicken tacos.